Weelllllll…. ok. We can sleep under embroidered sheets in embroidered PJs, with heads resting on embroidered pillow cases. But it’s not as if we can eat and drink embroidery. Imagine my surprise and delight when I discovered that you actually can find embroidery at the grocery store! It’s true! And not just any embroidery, but goldwork embroidery! The Queen of Embroidery Techniques, the most costly, the most regal embroidery…at the grocery store. Now, don’t get me wrong. You’re not going to find yourself in the produce section, stuffing beets into silk bags encrusted with goldwork. But if you happen to be in a Trader Joe’s, which is a small specialty grocery chain here in the US, and if you happen to wander into the wine section, you can find some beautiful goldwork. 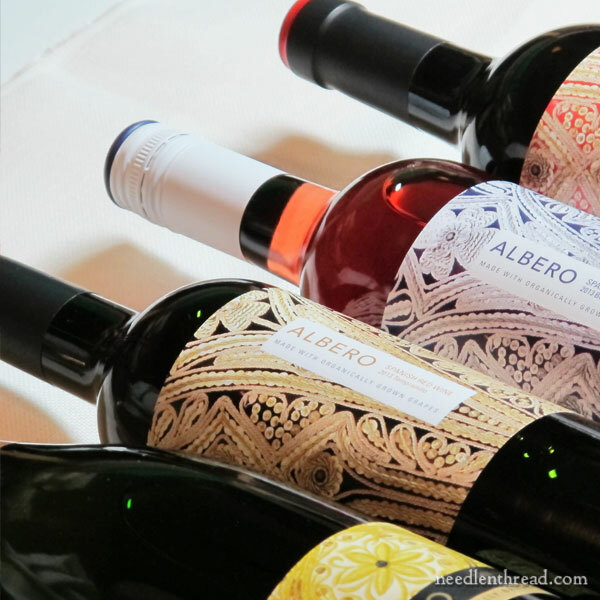 Albero is a Spanish wine made with organically grown grapes. From the Spanish red Monastrell and Tempranillo, to the rose, the sparkling white, and the Brut, each type of wine sports a fantastic label featuring Spanish goldwork. Am I planning on stocking my studio full of the stuff, just because there’s goldwork on the label? 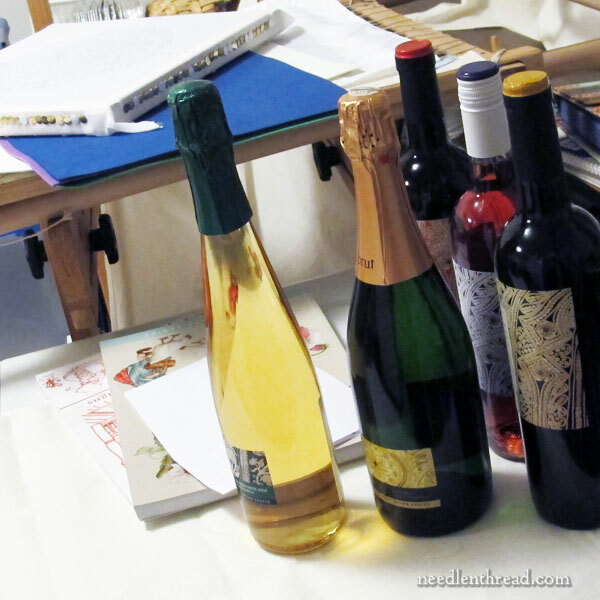 But I have friends and family who enjoy wine, and I think this stuff makes the perfect gift wine from me to them. And for those embroidery groups out there who get together now and then for a “Stitch and Sip” – an embroidery and wine gathering – I thought you might want to know there’s a wine available that fits the theme. Why not? It might also make a great addition to raffle baskets and the like at guild events. Now, don’t worry. I won’t be taste-testing today between stitches. I have a very specific stitching goal for the day, and I plan to meet it before the sun goes down. I’ll tell you about it down the road and show you the results. Coming up: Blackwork, Redwork, Crewel, and a tute! I think we cover a little bit of everything this week. April 22, 2016 Frostings Club Specialty Embroidery Threads – Unboxed! Wow Mary , you post the most interesting information, who would have known about the wine? I love the graphics on the wine bottles these days and collect them just to show in my wine rack. I will have to scout this one out as it is so meaningful to us embroiderers.Thanks. I see nothing wrong with a little nipper now and then in between stitches. You should taste test at least one. That with a little bread and you’ve got yourself a Communion meal. There! Justification. How wonderful embroidery while you drink. I have to confess I do like a tipple well, more then a tipple so I shall certainly look out for the wine and I would love to join a stitch and sip group that is just down my street. They are beautiful decorative labels and would look great as candle olders wince the wine has been enjoyed in fact they would look nice on your Hungarian Red Runner table cloth, ha ha! Thanks for sharing such a delightful post and informing us who enjoy a tipple of the decorative wine labels. Can’t wait for further interesting posts. Ha ha ha! I was just wondering what my stitches would look like if I were drinking wine, because I get goofy after one glass. This post gave me a giggle! Thank you for that! Alas, no Trader Joe’s here in Canada. Embroidery fits in EVERYwhere! Have you ever looked at the designs stamped into those paper doilies you put under baked goods, etc.? 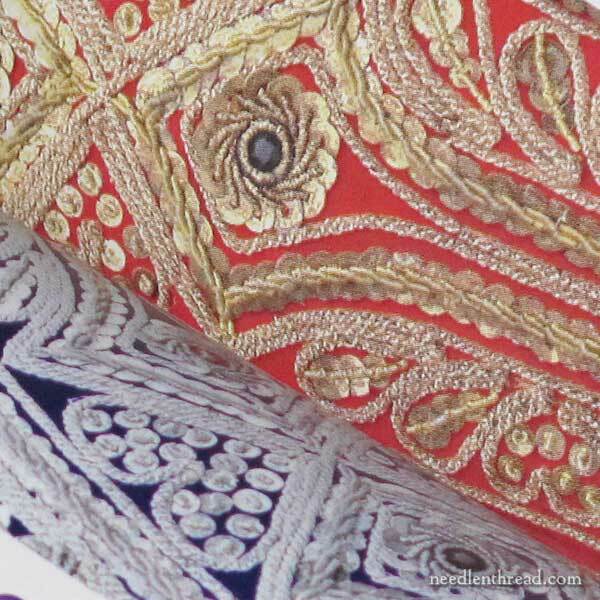 Those have always been patterned after embroidery — for many years it was princess lace. Sometimes cutwork and eyelet embroidery. Alas, as time goes on the quality of them seems to go down. Older ones have amazing (detailed) designs on them. They aren’t as detailed these days, but STILL embroidery!!! I have used doily patterns for quilting designs! Hi, I want to clarify the meaning of Albero. Albero is the sand of the bullrings (and the sand color too). Embroidery on the labels of wine bottles corresponds to “trajes de luces”, the costumes of bullfighters. While in Italy I came across some wines with whitework embroidery and bobbin lace pictured on the labels. I was delighted when the winery gave me some labels to take home! How delightful! I have never been to a Trader Joe’s. We have never had any around here. Last week on a trip to the doctors, my husband and I saw that one is coming. I’ve heard about them for so long that I am looking forward to it…but now. I guess my husband and I will be perusing the wine section. How exciting. I love your posts and the things you think to write about! Let me say up front, I’m not a true wine lover but there are wines that I like. I will confess, I too bought this wine for the label. It really isn’t good (vinegar comes to mind). Not because of the price – there are other cheap wines that taste much better than this. I want to make wine bottle tea lights with mine. What better bottle for tea lights for an embroidery lover? I agree it would also be great to go in a wine display, just because of the label, not because you plan to drink it. There is an Indian grocery story that sells all kinds of Indian food and spices that also sells saris, braid/trim and yardage from India. You might explore your local ethnic shops and be amazed at what you will find. I don’t believe we have Trader Joe’s in Australia, certainly not out here in the boonies anyway. But I love the labels, so I will keep my eyes out for anything similar. Although I can’t drink alcohol (it reacts with my meds) I do like choosing wine by the label. Unfortunately, here in PA, the State controls the sale of bottled wines, etc. No pretty embroidered labels at the Trader Joe’s here. Maybe the local State store will carry that wine. Next Next post: Tanja Berlin Online Blackwork Class – a Give-Away!